Here it is! The pattern for the little one-shuttle square. Actually I think I will use two shuttles for the demonstration because it's quicker to make the split ring (and join) and then also hide the end which I'll show in a new video. 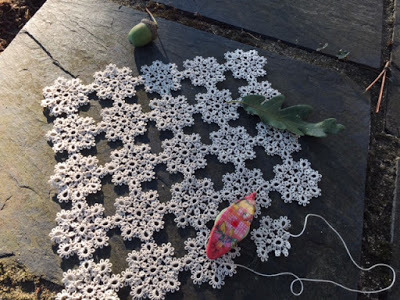 But it can be made with just one shuttle and, as for the medallion, use just the thread to finger-tat the second half of the split ring and mock picot. Here are four of them joined together properly (they were just placed side by side in the previous post, not actually attached). As you can see there is a bit of overlap of the side rings but I think it's okay. Or you could choose to make a shorter centre picot or even omit it altogether perhaps? Something to try. Something interesting happens when you join them together... Do you remember I showed the medallions joined together and how visually they seemed to become square? Well, look at the squares joined together... visually, they become round! I think it's easier to see in the smaller photo below where your eye is less distracted by the details. The outside shape is still square of course but if you squint, the shapes you see are round. Do you see what I mean? They do look square, don't they? Anyway, just an interesting fact I noticed! Clicking on the image above will take you to the pattern. so keep an eye out for it if you're interested/would find it useful. I'm definitely interested! 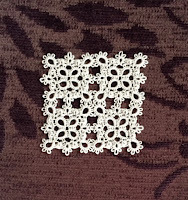 I have tried tatting the medallion shown in your first video. I will be starting over using two shuttles as you've suggested in this post. I messed up the finger tatting part, and it just didn't seem worth the effort to try and fix it. My space after the first ring was too long and it just didn't look good. Still, I am intrigued by the medallion and the way it looks when joined with others! I see the square and also the round shapes. But, in the bottom picture I see a square in a diamond in a square, looking from the center outward. 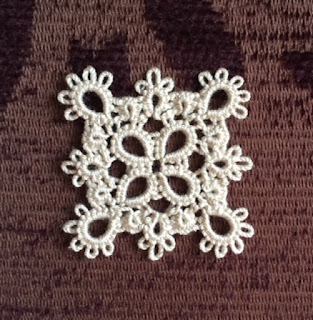 Lovely, thanks for the pattern. I’d like to try it with one shuttle. Some time. Lovely! 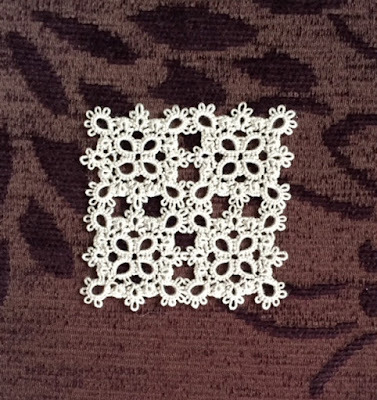 Thank you for the patterns and videos! How interesting, the circle in the square and the square in the circle! Thank you for another lovely pattern. I can't believe how quickly you have accomplished all this - and it all started with a fabric bag that has tatted images on it! I've already learned so much from your experiments, and I'm still amazed at your 1st video - haven't checked out the 2nd one! It's all a fascinating study of one-shuttle motifs! Thanks for sharing! I'll have to give it a go when I'm finished with my current knitting project. I have watched your video a few times. Love your blog!